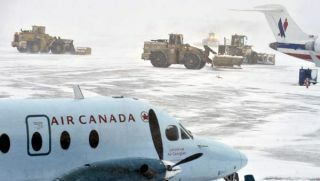 In the wake of the holiday blizzard travel chaos in the Northeast and Europe, the International Air Transport Association (IATA) is seizing the moment and launching a "think tank." Dubbed Vision 2050, the group will bring together representatives from government, industry and academia in Singapore in February, to look at industry response to crises, IATA director general Giovanni Bisignani says. Bisignani notes that the year-end holiday season "has been tough for travelers and for airlines" due to extraordinary weather conditions in Europe and the U.S."
He says the industry must not lose the opportunity to learn from the experience. The recent storms and the volcanic ash cloud that brought air travel to a halt in much of Europe earlier in the year serve as a reminder of the critical role that aviation plays in modern life, he says. Vision 2050 will examine ways to better prepare for such crises in the future, Bisignani says. The group also will evaluate the effects of the "long list" of government regulations that the IATA director say is handicapping the airlines. Meanwhile, IATA says the growth of airline traffic around the world slowed down a bit in November. Passenger traffic grew 8.2% from November 2009, with an average load factor – the percentage of seats occupied – of 75.6%. That compares to a traffic increase of 10% year-over-year in October. But IATA says the latest numbers were somewhat skewed because of an unusually rapid rise in traffic volume in the fourth quarter of last year. IATA says the slower growth does not necessarily signal a negative trend because traffic is still expanding at an annualized rate of 5-6%. The lingering weakness in some developed markets, which are in recovery mode following the financial crises in North America and Europe, is offset by the momentum in the developing world, IATA says.